KUALA LUMPUR (July 21, 2010):Suara Rakyat Malaysia (Suaram) lamented that the government has “yet to respond” pro-actively despite numerous recommendations made by human rights NGOs. Its 2009 Human Rights Report launched today, highlighted several key trends in declining human rights last year. It cited perceived abuses of power by law enforcement agencies, heightened intolerance towards dissent and resistance to reform, and greater respect for human rights. “With the massive arrests by the police over peaceful protests and street demonstrations, the freedom of speech, expression and assembly have been seriously undermined in the country,” said Suaram director Dr Kua Kia Soong. Kua said while the government had agreed to review the Internal Security Act (ISA), it has ignored two other detention-without-trial laws – the Emergency Ordinance and the Dangerous Drugs Act – despite their similarities with the ISA. Other laws like the Sedition Act, Official Secrets Act, and Section 27 of the Police Act also remain firmly in place, undermining the civil liberties, the report said. Among others, the report noted that there were eight deaths in custody – seven in police custody and political aide Teoh Beng Hock’s death while in the custody of the Malaysian Anti-Corruption Commission. Besides that, 88 people were shot dead by police in 2009 with not a single police officer known to be held accountable for any of those deaths. Suaram documentation and monitoring coordinator John Liu, who presented the report, said this was a high number considering there were only 13 such cases in 2007, according to official sources. “These cases continue to occur at an alarming rate in 2010, including the case of 15-year-old Aminulrashyid Hamzah, who was shot dead by police on April 26 in Shah Alam, and on July 5, four robbers were shot dead by police in Pahang,” he said. KUALA LUMPUR (July 21, 2010): Suara Rakyat Malaysia (Suaram) lamented that the government has “yet to respond” pro-actively despite numerous recommendations made by human rights NGOs. Its 2009 Human Rights Report launched today, highlighted several key trends in declining human rights last year. Civil and Political Rights” in Kuala Lumpurtoday, 21 July 2010. SUARAM’s report highlights several key trends in human rights in 2009, including: (1) the increasingly serious and repeated cases of abuses of power by the police and law enforcement agencies with impunity; (2) the heightened intolerance towards dissent; and (3) the Barisan Nasional (BN) government’s resistance towards reform and greater compliance with human rights standards. 1. Increasingly Serious and Repeated Abuses of Power by Law Enforcement Agencies At its launch, SUARAM noted the serious and repeated abuses of power – not only by the police, but now increasingly rampant in other law enforcement agencies, such as the Malaysian Anti-Corruption Commission (MACC). SUARAM also noted that there were at least two international reports published in 2009, exposing the collusion of Immigration Department authorities in the trafficking of refugees to the Malaysia-Thailand border. In 2009, there were 7 deaths in police custody, according to official statistics. Another death occurred in the custody of the MACC on 16 July 2009, when Teoh Beng Hock, an aide of a politician from the opposition Democratic Action Party (DAP), fell from the 14th floor of the MACC building when he was there for questioning by the Commission. While deaths in police custody have been a major problem in previous years, this was the first time that a death occurred in the MACC’s custody. Still, the MACC has also had a tarnished record in the past. In 2007, SUARAM documented the case of a man who died three weeks after being brutally assaulted during an interrogation by officers of the Anti-Corruption Agency (ACA), as the anti-corruption body was then known. hit with a golf stick, forced to strip and stand on a block of ice to an hour at a time, and threatened with death. The fact that Malaysia has to date refused to ratify the United Nations Convention Against Torture (CAT) despite being repeatedly urged to do so only goes to show that the government accepts torture as a form of punishment in this country! indeed alarming, considering that there were only 13 such cases, according to official sources, in 2007.
residence of an executive councilor of the state of Pahang. In 2009, there were mass arrests of participants of public peaceful assemblies in numbers which significantly exceeded those in previous years, signalling the government’s increasing intolerance of dissent. Close to a thousand people were arrested by the police for various acts of peaceful protest, including by holding candlelight vigils, wearing black and even participating in a hunger strike! Close to a Thousand Arrested during Peaceful Assemblies in 2009 In May alone, 167 people were arrested in relation to protests against the unconstitutional takeover by the BN of the Perak state government. On 1 August 2009, 589 people, including minors, were arrested during the massive anti-ISA rally in Kuala Lumpur– possibly the greatest number of persons arrested in a single public assembly in recent years. Opposition politicians, critics of the government and media (both of the opposition and independent ones) have also been attacked and harassed, using repressive laws such as the Sedition Act and the Printing Presses and Publications Act throughout 2009 despite the initial show of commitment towards free speech by Najib Razak when he announced the lifting of the ban on opposition mouthpieces Suara Keadilan and Harakah on the very first day of his premiership. Freedom of speech and expression, especially that of opposition politicians and critics of the government, has become one of the most seriously and frequently violated human right in Malaysia, and this trend has continued in 2010. Mouthpieces of the opposition political parties – Suara Keadilan, Harakah, and Rocket – were all given show-cause letters in the month of July in 2010. Despite the continued momentum of demands for change and better compliance with human rights principles, the BN government has continued to resist change. Despite growing calls for the ISA to be abolished, for example, the government has continued to detain people without trial throughout the year. At the end of the year, there were nine ISA detainees still incarcerated without being tried in the courts, while more than a thousand people were still being held under the two other detention-without-trial laws, the Emergency Ordinance and the Dangerous Drugs Act. Even recommendations made by commissions set up by the government, for example the Royal Commission on the Police and the Human Rights Commission of Malaysia (SUHAKAM), have mostly failed to be implemented by the government to date. Malaysia’s human rights record was reviewed by the international community under the United Nations Human Rights Council’s Universal Periodic Review. During this review, the Malaysian government received numerous recommendations from United Nations member states to improve its human rights record, including by abolishing all detention-without-trial laws, respect freedom of expression, and recognise the status and rights of refugees. However, most of the more substantial of these recommendations were not accepted by the Malaysian government. This reluctance to heed the international community’s calls, nevertheless, did not stop Malaysia from seeking election into the United Nations Human Rights Council in May 2010.
groundswell of popular calls for change, SUARAM stressed that it will continue to work towards keeping up this momentum with the aim of improving the situation of human rights in the country. restricted residence) as guest speakers at the launch of its report. Based on the testimonies of violations provided by Mat Sah and the parents of Jagendran, as well as documentation of numerous cases in previous years, SUARAM strongly urged the government to repeal all detention-without-trial laws, pointing out that these legislations severely violate fundamental human rights. 5. The strengthening of SUHAKAM’s independence and effectiveness, and the implementation of the Commission’s recommendations. In response to the increasingly serious human rights abuses and the heightened intolerance towards dissent and opposition as witnessed in 2009 and 2010, SUARAM noted that it will also heighten its role as a watchdog of the BN federal government as well as both the BN and Pakatan Rakyat state governments, and further warned that failure to heed the increasingly popular calls for human rights compliance would result in the unpopularity and eventual downfall of any government in power. Mohamad Fadzullah – Yet another Victim of the ISA! Gerakan Mansuhkan ISA (GMI) and Suara Rakyat Malaysia (SUARAM) are astonished to learn of the latest arrest under the infamous Internal Security Act (ISA) in the midst of Government talks on amending the Act. GMI condemns the new arrest under the ISA. To invoke the ISA against this individual is absolutely against the fundamental principles of human rights, justice and international human rights standards. Mohamad Fadzullah Bin Abbul Razak, 28, was arrested under the ISA on 15th July 2010 as he was returning to Malaysia from Thailand. He is alleged to be involved in international terrorist networking. GMI strongly condemns the new arrest under the ISA. The Government must guarantee safety of the detainee and he should be allowed legal assistance immediately. Under the ISA, detainees can be held for up to 60 days in secret locations and in solitary confinement, often in a windowless cell where they lose all sense of time and are at risk of torture and other ill-treatment. Detainees have been assaulted; forced to strip; deprived of sleep, food and water; told that their families would be harmed; and subjected to prolonged aggressive interrogation to force confessions or obtain information. GMI believes that the new detention may have been initiated in response to international pressure on terrorist threats in Malaysia. However, nothing can be confirmed at this juncture. Using ISA to confirm this by means of possibly forcing confessions or creating unproven plots and links is unjust and unscrupulous. GMI values that the security of the country is of utmost importance and does not condone any terrorist activities, but one’s entitlement to a fair trial should not be deprived on any basis. If the Government has evidence against the suspect, we urge the government to charge him in an open court; otherwise, he should be released without any delay and unconditionally. Accusing someone of committing crime without producing credible evidence is slanderous; detaining someone without trial, and not giving him a chance to defend himself is barbaric! It is a shame that the Government is again practicing double standards on issues related to ISA. On one hand, it plans to review the ISA but on the other hand, new detention is carried out discreetly as no prior announcements were made. This incident exhibits yet again the true colours of the ISA, which is extremely arbitrary and has been abused in the pretext of national security. It was previously confirmed that the ISA is only a political tool used to silence dissidents and criticisms against the government. We demand the government to release all detainees immediately or charge them in open court. GMI and SUARAM urge the people of Malaysia to demand for the release of all ISA detainees and for the abolition of the ISA once and for all. Let us fight for our rights and for a better Malaysia without the ISA which allows detention without trial. Venue: Mandarin Court Hotel, 55 Jalan Maharajalela, 50150 Kuala Lumpur. Kindly confirm your attendance with John Liu at 03-77843525 / 77835724 or [email protected] by 19 July 2010. We look forward to seeing you there. When Najib Razak succeeded Abdullah Badawi as the Prime Minister of Malaysia in April 2009, he promised reforms in response to the growing demands for action to implement human rights compliance and democracy. This promise did not materialise. Instead, the year saw a massive crackdown on the freedoms of speech, expression and assembly, with close to a thousand people arrested for peaceful forms of protest, signalling an increased level of intolerance shown by the Najib government towards dissent as compared to that of his predecessor. 2009 saw the biggest anti-Internal Security Act (ISA) rally to date and it forced the government to announce a review of the draconian legislation. Nonetheless, more than one thousand individuals remained in detention without trial. At the international level, the government’s record on human rights deteriorated with at least two high-profile reports in 2009 highlighting the collusion of government authorities in the trafficking of refugees at the Malaysia-Thailand border. When Malaysia’s human rights record was reviewed by the United Nations in 2009, most recommendations and criticisms by the international community were rejected by the government. 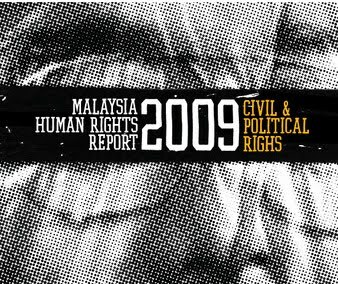 Consistent with its record since 1998, this edition of SUARAM’s Annual Human Rights Report on Malaysia documents the trends and cases of human rights violations in the country, as well as the struggles of the Malaysian peoples and human rights defenders in 2009.